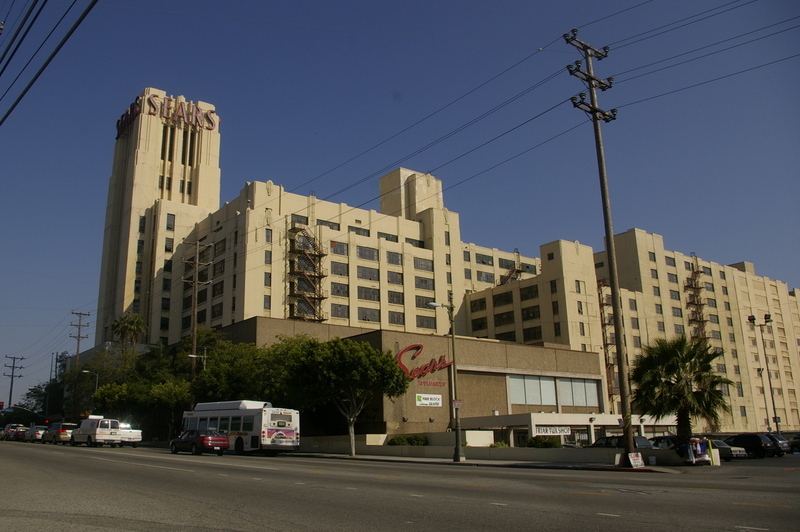 Oscar De La Hoya is reported to be in the final stages of purchasing the Sears, Roebuck & Co. building in Boyle Heights for an undisclosed price. Add + : Los Angeles Daily Journal has more at East L.A.'s Golden Boy Lands Big One. Daily Journal clip after the jump. Add + + : Comments will ensue and provide a Tale of the Tape at CurbedLA. View Portal Opener. Los Angeles Daily Journal reports: De La Hoya agreed last week to purchase the property for more than $70 million. His company, Los Angeles-based Golden Boy Enterprises LLC, in conjunction with partners Manarino Realty and Highridge Partners Inc., both Southern California developers, purchased the property from MJW Investments Inc. The property, which is located at Olympic Boulevard and Soto Street, includes a still-operating Sears retail store and a long-closed Sears, Roebuck & Co. distribution center in a 1.8 million-square-foot complex. The industrial parcel, which is near the Los Angeles River, would require zone changes for a redevelopment plan to move forward. The property also lacks the necessary entitlements for a mixed-use project. Ovrum said that city subsidies will be necessary to make the property’s planned retail component – which could be between 700,000 and 900,000 square feet – pencil out economically. The property is expected to go into escrow within days and the deal is expected to close in the first quarter of 2008. Sources say the redeveloped site could be opened in 2012. “I had envisioned a diverse, urban, mixed-use development and these developers with their resources and ties have a really great chance to make it happen,” said Weinstein, who worked with the local City Councilmember Jose Huizar and the Mayor Office’s on the project. Golden Boy Enterprises did not return calls seeking comment. John Long, chief executive of El Segundo-based Highridge Partners and a co-founder of Golden Boy Partners, the urban development unit of De La Hoya’s company, was traveling last week and was unavailable for comment. Cool, I hope he uses it to expand his charter school program. It's nice to hear that Oscar is buying the building. I remember when his friend Eric used to work at Sears and use to tell us about a friend that was a boxer and that he was going to become very famous. Now he is will buy the Sears Tower " The friendliest store of Boyle Heights.